Your search for answers following the fateful performance of The King in Yellow has taken you across the sea to Paris, where you encountered a stranger whom you suspect is somehow connected to the mystery. Now, you must descend into Paris’s labyrinthine catacombs if you hope to uncover the truth and bring an end to the strange happenings that followed the cursed play wherever it is performed. The Pallid Mask, the fourth Mythos Pack in The Path to Carcosa cycle for Arkham Horror: The Card Game, is on sale now at your local retailer or online through our webstore here! You have followed this path past the point of no return, and you must either find your answers or die in your pursuit. This scenario leads your team of investigations into the catacombs that lie beneath the streets of Paris, where untold horrors await. Deep within the cold earth, the dead are watching you. From the vacant holes of ancient skulls, the Eyes in the Walls (The Pallid Mask, 260) see into your heart, filling you with terror and dread. This chilling environment is just a taste of what you can expect to find within these catacombs, as a test for your Willpower. 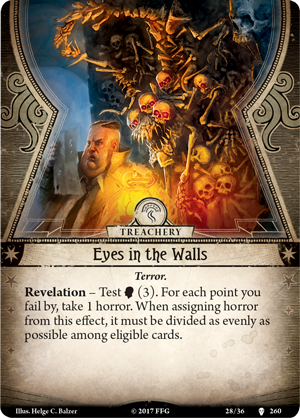 For this treachery card, you will take one horror for each point you fail by as you behold the terror of the doomed souls that came before you. But you have already come too far to turn back. The passages beneath Paris are twisted in every way. What direction will you choose? 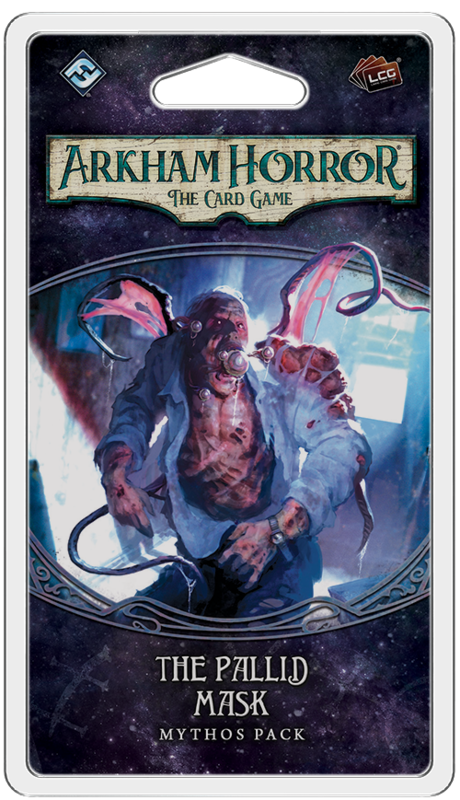 The disorienting passages of The Pallid Mask present a unique challenge unlike anything you have seen in Arkham Horror: The Card Game. Rather than laying out the locations that you will uncover at the start of the scenario, you begin by placing only a single location as you enter the subterranean maze. 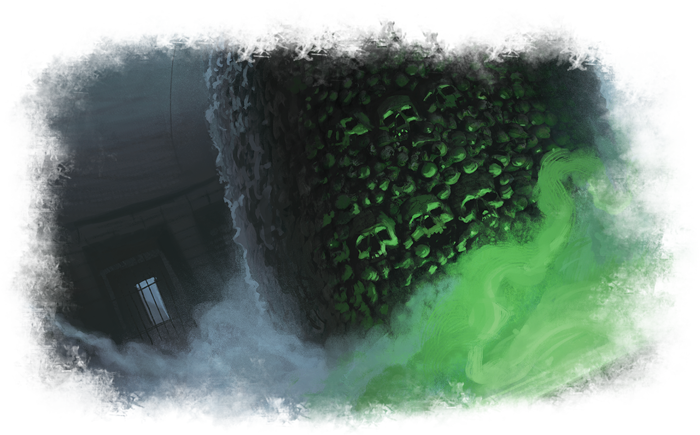 From here, the Catacombs cards create their own distinct deck that you uncover as your investigation progresses. You may be told to lay out these locations in any direction from the places you have already discovered, forcing you deeper beneath the soil. Trapped in the dark where the light cannot find you, there is no telling where you will end up. Thus far in your investigations, you have seen and experienced more than any human should have to bear. 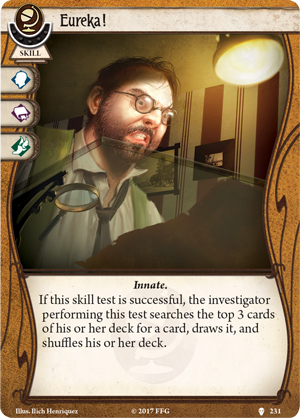 It has brought you to the brink of death and madness, but it has also sharpened your mind to make you a better investigator. All that you have learned will come into play as you attempt to escape the labyrinth of The Pallid Mask. In the musty darkness, you or one of your fellow investigators may experience a Eureka! (The Pallid Mask, 231) moment—and if this moment of clarity occurs as your investigator succeeds at a skill test, you may search the top three cards of your deck and add a card to your hand. After all the horror you have witnessed as a hardened investigator, the Parisian catacombs may seem like child’s play to you. If you are feeling Bold, you may decide to go Mano a Mano (The Pallid Mask, 229) with one of the creatures that haunt the twisted ossuary. 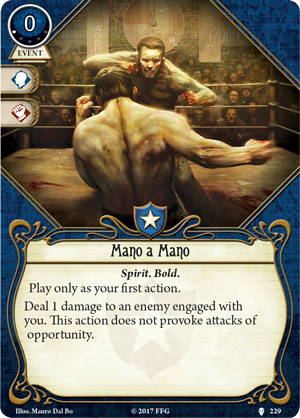 By striking first, you can deal one damage to an enemy engaged with you without provoking attacks of opportunity. You may even go so far as to become a total show-off, shouting "Watch This!" (The Pallid Mask, 233). This Gambit invites you to bet on your own abilities during a skill test. 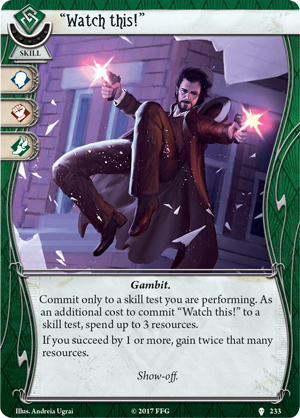 As an additional cost to this card, you can spend up to three resources, and if you succeed your test by one or more, you gain twice that many resources! Still, you must make sure that your confidence does not turn to arrogance, for pride always goes before a fall. Turn away from the sun and uncover the secrets hidden beneath the streets of Paris. Summon your courage, but proceed with caution. Your bones may be the next to become part of the architecture. Pick up The Pallid Mask (AHC15) at your local retailer today or on the Fantasy Flight Games website here!